ruthdelacruz | Travel and Lifestyle Blog : WIWTD + What to Wear on a Long-Haul Flight? WIWTD + What to Wear on a Long-Haul Flight? My longest travel was actually from Manila to Toronto - but total flight time was only 12 hours from Manila to Vancouver, and another 4 hours for local flight. My good friend #A called me hours before my flight and she was so excited for me (I love my friends!). One of the questions she asked me - what are you wearing? I laughed how effortlessly funny she is! I told her I don't want to look like a typical tourist and that I was channeling the #modeloffduty peg. Most of the passengers who were waiting at the boarding gate were wearing boots and fancy jackets, while I was wearing a simple plain top and jeans. If only I could wear pajamas, I would. I know it was going to be a long and tiring flight. I actually have two styles in traveling - going out of the country, I wear comfortable clothes and shoes; going back, I wear all the heavy clothes with me (because I know my luggage would be full and loaded by then). Plain (Comfortable) Shirt: I wore a simple white shirt which I can accessorize with scarf or jacket. Jeans: I love wearing skirts and shorts, but for long flights - I know airplane temperature can be really cold - so I wore my favorite denim. Shoes: I wore flats which I can easily take off for security checks in the airport. I looked at the other travelers boarding the plane wearing fancy and elaborate clothes. I refused to calculate the time they spent fixing them after security check. I wore the most comfortable flats (I brought my boots in my luggage). Sling Bag where I kept my travel documents (passport, ticket), money, and other important items. Travel Bag (from Freeway Art Collection) where I kept my clothes, gadgets, books and other travel stuff. Scarf: I always bring scarf whenever I travel. It works as a blanket and pretty accessory upon landing. Socks: I wore socks most of the flight hours because the plane temperature was freezing (gives you an idea why I wore flats and comfortable shoes). Sunglasses: again for that rock star look Hehe. Extra clothes: In case my luggage gets lost, I have extra clothes (and underwear!) to wear if shopping is not possible at the time of arrival. Gadgets: To keep me entertained. Bottled Water: Hehe yes, I was able to sneak it inside the plane. I needed to keep hydrated. The whole flight, I only asked for water and ditched coffee, juices and carbonated drinks. Here's my picture taken upon arrival. I still look decent after hours of non-sleep and boredom in the plane. Yes? Comfort always comes first for me :) I asked my "personal driver" to take a photo of me. Hehe. I couldn't remember the temperature then, but I know it was not as cold as I expected it to be. The collage basically represent the pieces I have worn. If you want to buy the same pieces I wore, I recommend, SheInside for the leather jackets and jeans (the store ships worldwide). For plain shirts, go for the Giordano Classics (they are back!). But I buy mine from WetSeal. H&M has a lot of nice scarves and flats too. Just make sure that you bring comfortable shoes whenever you travel. Bring a nice sling bag to give you a chic look. You can get nice sling bags from Lazada's new fashion line - LZD. Here's my first picture taken outside the hotel in London - Cumberland Hotel. More travel stories, style tips (and hopefully #ootd 's) soon! What do you wear on a flight? Read here for my thoughts en route to London. 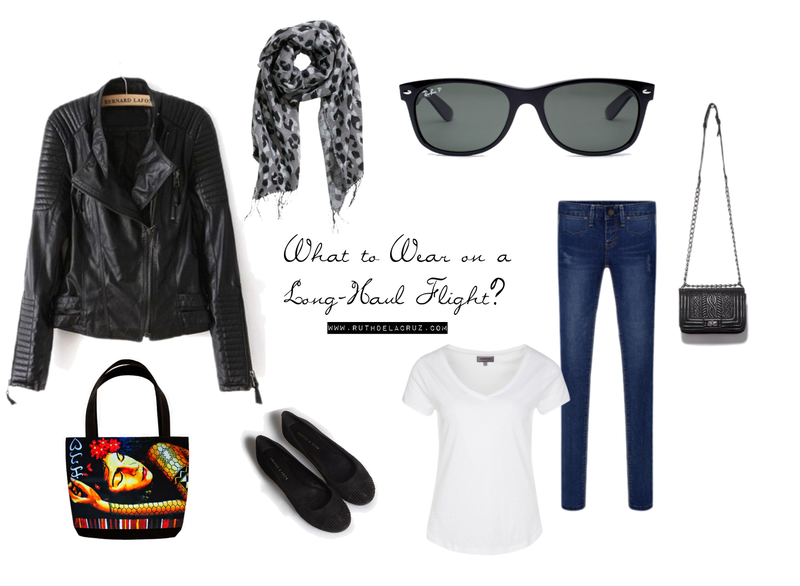 © ruthdelacruz | Travel and Lifestyle Blog : WIWTD + What to Wear on a Long-Haul Flight?